Seltjarnarnes Iceland in Reykjavik was the perfect place to get in touch with Icelandic nature and birds without leaving the city limits. I was super-excited to take a walk in Reykjavik. I'd spent so much time over the previous few days in a car driving around South Iceland and the Golden Circle that all I wanted to do was stretch my legs and go for a hike. But what are the best places to walk in Reykjavik? Starting in Reykjavik's city center, I took myself on a self-guided walking tour in Seltjarnarnes. Read on to learn more about how to spend an afternoon walking from Reykjavik to Seltjarnarnes. I knew that I had a long walk ahead of me out to Seltjarnarnes so it was important that I was well fed before setting out. I stopped into Snaps Bistro for their lunch plate of the day ($1990 ISK, about $19 USD at the time of writing) and a glass of wine. 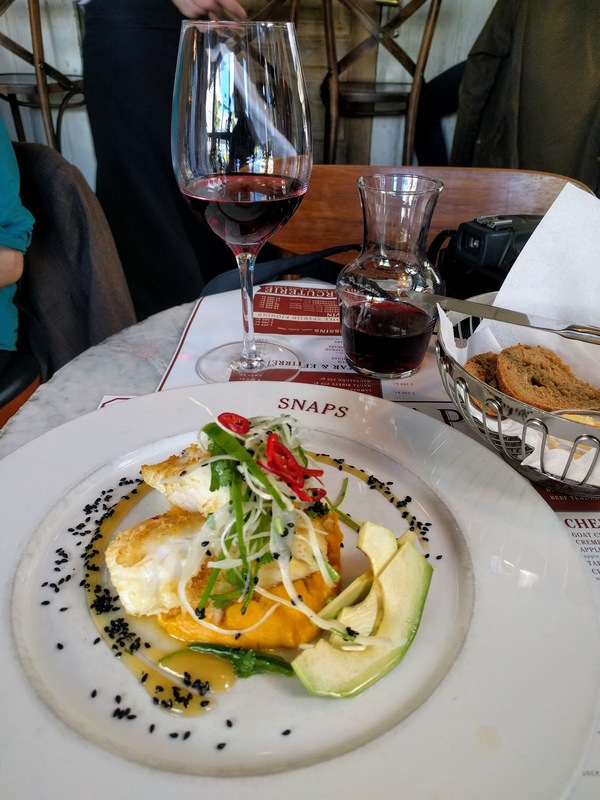 Eating in Reykjavik can be very expensive but it's a little more affordable when you seek out a lunch deal like the one that I found at Snaps. I planned my Reykjavik walking route over lunch and set out toward Seltjarnarnes with Google Maps as my guide. En route, I discovered Hólavallagarður and decided to take a detour on my hike through the cemetery. Hólavallagarður was idyllic. I especially enjoyed seeing the garden birds of Iceland foraging for nesting material and worms. Continuing my Reykjavik city walk, I emerged onto the sea at Skerjafjörður. Looking out over the calm blue waters, I felt like I'd left Iceland's capital behind. I'd only walked for about 30 minutes but I felt like I was in another world as I made my way closer to Seltjarnarnes. The rocky path hugged the coast. Looking inland, I was surprised to seeing two silver statues, modern art at its finest, sitting outside someone's home in Reykjavik. The scene just made me smile. This is something I totally would have missed if I hadn't taken the time for this Icelandic city walk. Pressing further into my Reykjavik walking route, I arrived at the far end of the Seltjarnarnes peninsula. As I walked, the houses faded away and I was left with pure nature. As I was staring at the scenery, I heard an insistent bird call. Looking around the trail, I discovered a wayward seabird perhaps looking for a mate in the tall grass. The black rocky beach on the protected south side of Seltjarnarnes peninsula was dotted with terns and plovers. A black-headed gull in full breeding plumage pranced about. It was hard to believe that my city walk in Reykjavik had taken me to such a remote and beautiful place. The weather in Reykjavik can be fickle and highly dependent on where you are. The Southern edge of Seltjarnarnes peninsula forms a protective bay and the water is extremely calm. Walking to the far western edge of Seltjarnarnes peninsula and peeking over the dunes is an entirely different story. The sea is rough and the wind blows fiercely. I quickly retreated back behind the protective barrier. A large lake forms the center of Bakkatjörn Nature Reserve. I spotted a bird hide and walked over to it. This was a great spot to do some birdwatching while taking a break to warm up from the chilly early June air. I spotted a pair of whooper swans in the distance with cygnets. Even beyond the birds, the view from the hide was simply magical. 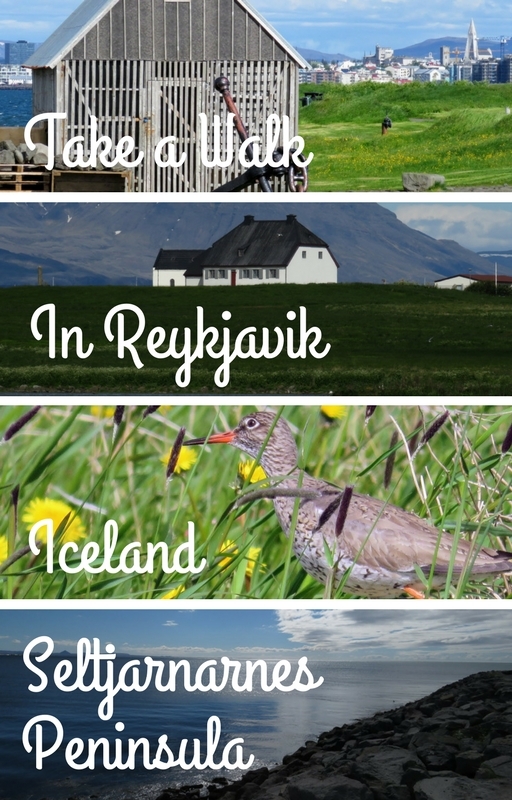 Who knew that there was so much to do on a day in Reykjavik without a car. ...and a merganser dive and resurface on the lake. From inside the hide at Bakkatjörn, I could see geese and oystercatchers waddling in the grass. I spotted some geese heading north against a backdrop of beautiful mountains and decided to continue my walk to follow them. The geese led me right to Grótta Lighthouse. It looks like you can walk out to this island off the coast of Reykjavik at certain times of year at low tide. When I visited Reykjavik, the island was closed off due to nesting birds. I satisfied myself with a view from a distance and then moved on. My self-guided walk around Seltjarnarnes soon brought me to the windswept north coast of the peninsula. Birds nested and hunted from the rocks as choppy waves broke. The north coast of Seltjarnarnes is a great place to walk for Reykjavik city views. Looking back, I could see Reykjavik's iconic cathedral (Hallgrímskirkja) and the modest skyline of Iceland's capital. By the time I'd hiked a loop around Seltjarnarnes and emerged on the north shore of the peninsula, I'd been walking for a few hours. Prior to my departure, I'd checked Google Maps and learned that there was a bus stop nearby. Conveniently, my hotel (Icelandair Hotel Reykjavik Natura) included a Reykjavik City Card with our accommodation so all I had to do was wave my pass and get on the bus. It's worth checking to see if your hotel does something similar or if it would be possible to purchase a Reykjavik City Card for unlimited rides on the city bus in Reykjavik. The walking distances in Reykjavik are deceptively large and the scenery is so nice that as I was hiking I kept telling myself "I'll just go a bit further". The Reykjavik City Card was a real leg-saver. The bus dropped me off near Radisson Blu Saga Hotel and from here, I was able to continue my Reykjavik city walk to Vatnsmýri. Vatnsmýri is a park with the domestic airport on one side. The wetlands in Vatnsmýri are a great place to walk in Reykjavik. When I visited in June 2017, geese and their chicks were foraging near the water's edge with beautiful views of Reykjavik Cathedral in the background. I was even able to climb this giant chair. The chair almost looked like a lifeguard station but in reality was just a lovely spot to get above it all, rest my legs, and reflect on how I'd spent the day in Reykjavik. I concluded my self-guided walk in Reykjavik with a fine dinner at AALTO Bistro, a small restaurant located at the edge of Vatnsmýri in Norræna húsið (the Nordic Cultural Center). I toasted the discovery of so many great places to walk around Reykjavik with a glass of champagne. AALTO Bistro has a vegetarian focus with Nordic flair. I tried the herb omelet. The food was amazing and AALTO really felt like a hidden gem for fine cuisine in Reykjavik. The decor was fantastic too with lots of light streaming in through the bottles filled with colored water sitting in the window. Have you taken a walk in Reykjavik? What are your favorite places for a self-guided walking tour? Leave a comment below to let me know. Take a walk in Seltjarnarnes Iceland. Explore the scenery and go birdwatching on foot on the Seltjarnarnes Peninsula within the Reykjavik city limits.